Well, a list of classic fall New England runs wouldn’t be complete without tribute to Norman Rockwell… Run through the town that inspired the great American folk artist Norman Rockwell at the Norman Rockwell Museum grounds in Stockbridge, Mass. 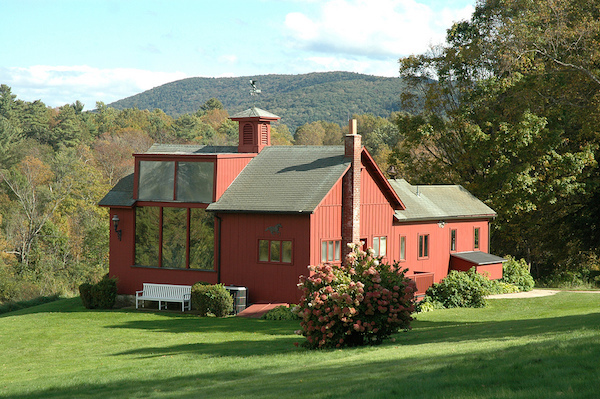 Aside from an extensive collection of art by Rockwell and others, the museum boasts a 36 acre property, punctuated by impressive gardens, larger than life sculptures, and a series of lovely paths which wind through apple orchards down to the Housatonic River. If you’d like to extend your run past the museum grounds, the museum recommends a route Rockwell was known to enjoy biking on. This 7 mile one way route follows Route 102 (West Stockbridge Road) from the Museum grounds until the intersection with Averic Road, which brings you to the scenic town water supply. Route 102 is nicely paved, with a shoulder the entire way, while Averic Road sees very little traffic. No matter which route you choose, Stockbridge is possessed of that rural New England charm for which Rockwell was known. Afterwards, you can relax with a stroll through the museum or a treat at the Museum’s own Terrace Café (open Memorial Day through Columbus Day). 1-2 miles on the Museum trails; Other good loops in area, using Rt. 102 & Averic Rd.